Illuminated Manuscript, Album of Indian miniatures and Persian calligraphy, Walters Art Museum Ms. W.669, fol.7a, originally uploaded by Walters Art Museum Illuminated Manuscripts. This is an album (muraqqaʿ) compiled in the late thirteenth century AH / nineteenth CE, or possibly later. It contains nineteen Deccani paintings and four pages of shikastah calligraphy (fols. 3b, 7b, 8a, and 9b), one of which is dated 1211 AH / 1796 CE (fol. 3b). The paintings, which date to the late twelfth century AH / eighteenth CE or thirteenth century AH / nineteenth CE, come from a ragmala series attributable to the Deccan. A ragmala is a visualization of a musical mode or melody. 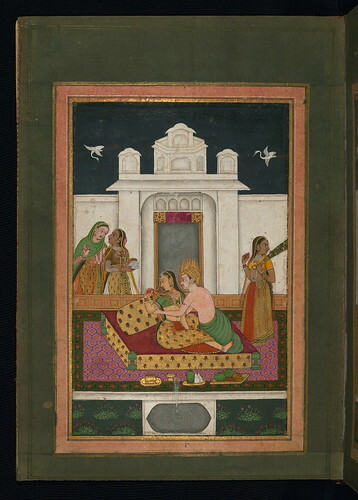 This album contains a mix of visualizations of ragas (male musical modes) and raginis (female musical modes considered to be the wives of the male musical modes). The codex was formerly in an accordion format, and the multicolor flexible cloth hinges on the leaves are still visible. It was later rebound in a brown goatskin binding with a central lobed oval.